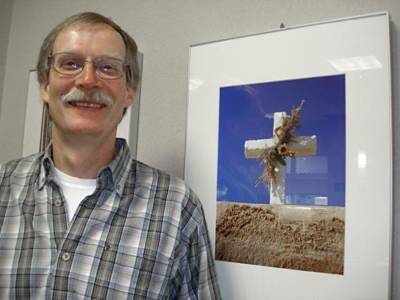 Northwest Vista College Instructor Simon Van Dijk was recently honored by NVC student Kirsten Osborne, who wrote an essay about him for the NISOD student essay contest. Being a 27-year-old veteran, I’ve had plenty of time to get to know my strengths and weaknesses. Strengths: rote memorization, empathetic, honest, sincere, kind. Weaknesses: patience, disorganization, lack of fashion-sense, and the big one, anxiety. Every once in a while, my anxiety gets out of control and I begin to panic. But, as I’ve matured, I’ve tried to turn this anxiety into a super-power of mine. I worry about tests like any other student, but I obsess over my notes and due dates so much that I’m overprepared weeks ahead of time. So, the first Monday of fall 2017, I sat in my seat with my molecular kit, highlighters, and sturdy binders ready, excited, anxious for organic chemistry to absolutely blow my mind. And that’s when it happened. Sometimes, unfortunate and unseen events occur and there is nothing you can do to plan for them. As someone who must be in control at all moments, an unrehearsed incident, especially on the first day of class, is my biggest fear. My phone rang and I knew it was the start of a very difficult semester. When I stepped outside to answer it, I heard my father on the other end. My father, my superman, sounded like he had my anxiety caught in his throat as he told me that he and the rest of my family were stuck on the second floor of their house due to flooding from Hurricane Harvey and awaiting rescue. After class, I introduced myself to Dr. Van Dijk, apologized for running out of the classroom, and told him that I would have to drop the course all in one breath. My husband and I had just purchased a house the previous Friday, and I couldn’t comprehend our next moves, let alone how I would be able to study for such a difficult course with my anxiety issues. But, Dr. Van Dijk was calm and personable as I explained my situation with a shaky voice and wild eyes. His earnestness when he told me that he believed I could make it through the course and he would tutor me when I missed class due to future supply-runs to Houston convinced me that trying would not be the death of me. He didn’t just tell me he would help and support me, but he was persistent. Every day that I showed up for class, he asked me for an update about my family and asked if there were things he could help out with. Honestly, I’m incredibly thankful and don’t believe he is aware that, if it weren’t for him and his kindness, I would have dropped Organic Chemistry after my first day of class. But, because of Professor Van Dijk, I made it through one of the hardest times in my life and thoroughly enjoyed his class. In the future, when I’m faced with unexpected difficult moments, I’ll remember that my anxiety can’t win when I’ve got a mentor like Professor Van Dijk in my life.